The All-Star Game is tonight in Albany! The 2016 PGCBL All-Star Game will take place tonight at Bob Bellizzi Field at the Christian Plumeri Sports Complex in Albany. 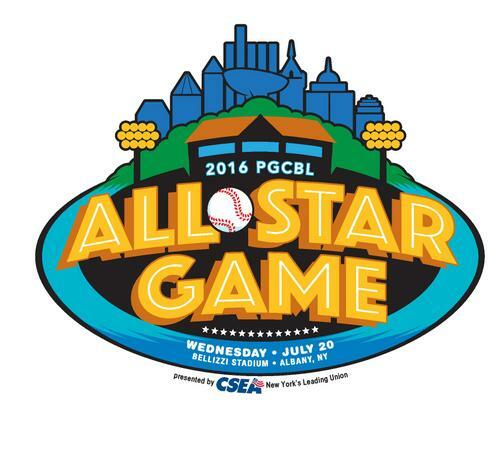 The game will feature all-stars from the PGCBL East taking on the all-stars of the PGCBL West and is sponsored by CSEA. First pitch of the All-Star Game is scheduled for 7:05 p.m.
Blake Nation, who led the Mohawk Valley DiamondDawgs to the 2015 PGCBL Championship, will lead the PGCBL East All-Stars. Matt Burch, the head coach of the Elmira Pioneers, will guide the PGCBL West All-Stars. "The PGCBL All Star Game has been a extraordinary showcase for the great young talent in our league. More than 75% of the players who participate in the game eventually sign professional contracts," said PGCBL President Jeff Kunion. "The Albany Dutchmen have planned a great day for the fans. It is going to be a fun-filled event." The Home Run Derby will take place prior the the start of the game. One contestant from each of the PGCBL teams has been selected by their organization to compete in the 2016 PGCBL Home Run Derby. All competitors will use aluminum bats provided by the Albany Dutchmen. Players will compete in timed rounds to see how many home runs they can hit in 2:30. Each home run hit during the first 2:00 of the round will count as one (1) point. Each home run hit during the final :30 of the round will count as two (2) points. Any batted ball prior to time expiring will count towards point total. The top three (3) point scorers in Round 1 will advance to the Finals. Round 1 tiebreaker: Most overall total home runs hit during entire 2:30 round. Second tie breaker: fastest time recorded to hit first home run during the round. The Home Run Derby is scheduled to begin at 5:30 p.m. There will be Scout Day activities that will give the All-Stars a chance to show off their skills in front of major league scouts. There will be live stats and a video broadcast available. Simply go to the league's Scoreboard page, here, to follow the game. Wednesday is forecasted to have a high of 83 degrees with sunny skies. There’s a 0 percent chance for rain, according to The Weather Channel. A perfect day for baseball! The PGCBL is affiliated with Perfect Game USA, the largest independent scouting service in the country. This year, more than than 1,250 professional players have either worn the uniform of a PGCBL team or participated in a Perfect Game USA event.